Natural sea sapphire ore, no post-processing, drilling with pure silver buckle, more original style. https://farm8.staticflickr.com/7802/47255402671_2a6e6c97b2_b.jpg https://farm8.staticflickr.com/7808/46531874724_7be0128d73_b.jpg https://farm8.staticflickr.com/7902/32313408377_4163ae07e8_b.jpg https://farm8.staticflickr.com/7879/33379650418_8502a87629_b.jpg https://farm8.staticflickr.com/7847/46531872584_25d1571059_b.jpg **Our original design. Do not copy in the same industry** **Natural Aquamarine Pendant Pendant** **Black Star Diopside Silver Pendant** color: blue Origin: Brazil Hardness: 7 Material: Natural Aquamarine, 925 Sterling Silver (International Standard Grade 925) Size: 30mm long x 16.5mm濶x 9.5mm - Does not include silver buckle measurement - Does not contain silver chains ***All the products are made of natural spar and ore, which is guaranteed to be 100% natural goods; if there is a holiday, it can be paid at a discount** **Hailanbao** **Aquamarine** Aquamarine, also known as the sea sapphire, has a legend in ancient Rome that "the treasure of the sea elves was hit ashore and turned into a gem." Since ancient times, this gem has also been promoted for creativity, towards an independent lifestyle, giving rational action and improving the effectiveness of expression. 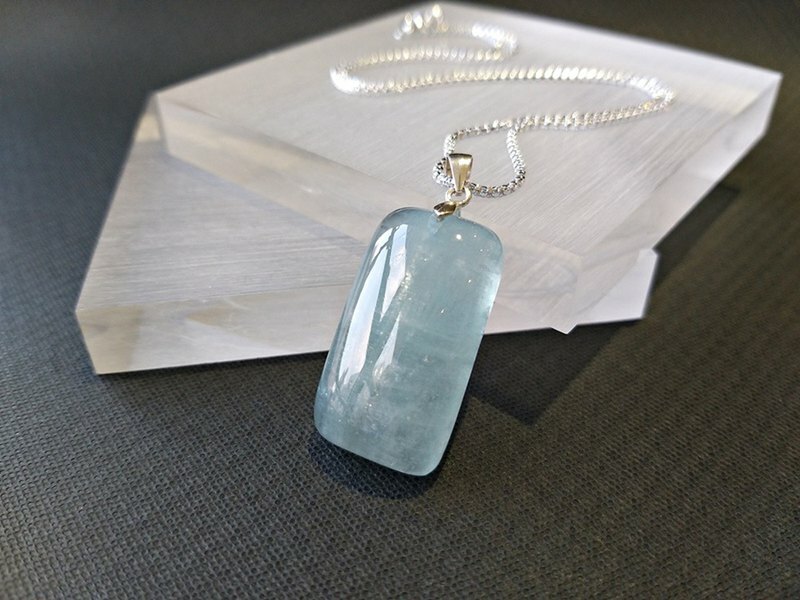 Aquamarine also symbolizes a carefree life and life; it is also thought to make language expressions smooth, helping you to express yourself and improve communication skills. In addition, this gem can inhibit rhinitis, treat sore throat, reduce fever, lower blood pressure, soothe mood, and also have the effect of purifying blood. ^^^^^^^^^^^^^^^^^^^^^^^^^^^^^ **<Product Maintenance>** - Pay silver cloth and moisture-proof bag - Brushed silver cloth can brighten sterling silver but silver cloth can't be washed with water - Pure silver can not be washed with silver wash water - Put it into a moisture-proof bag when it is not worn, it can be used for anti-oxidation - Take it when taking a bath and sleeping -**sterling silver can not be cleaned with water or salt water** - Please use a crystal cluster or amethyst hole to clean the spar without touching salt or water. - The spar must be purified to maintain the effect of spar energy - If the bracelet is damaged in the future, you can send it back for repair. ***paid return shipping** -**If sterling silver has been soaked in water or salt water** **Not refundable** <><><><><><><><><><><><><><> **<Send Notice>** **Sent to Hong Kong: -** ~ SF Express sent out ~ can be sent to the company, smart cabinet, SF station to pick up ~ Sending home will incur additional charges ^0^ ^0^ ^0^ ^0^ ^0^ **There are two ways to send to Taiwan:-** **1/ SF Express: -** ~ If there is no special requirement All are sent by SF Express ~ Can be received from Hong Kong for approximately 2-4 days **In case of holiday** **Will delay the date of receipt** **please wait with patience** ~ Can be sent to home, company, store to shop (7-11, family, Lylefu, OK convenience store) # Please check if the store has a pick-up service first. ~ Please leave the <store code> and <name> of the convenience store **2/ Mailing registration: -** ~ All over the area are selected by mailing registration ~ Can be received from Hong Kong for approximately 5 - 8 working days **In case of holiday** **Will delay the date of receipt** **please wait with patience** ^0^ ^0^ ^0^ ^0^ ^0^ **Shipping time to Malaysia:-** 1/ Posting registration: - ~ Can be received from Hong Kong for approximately 7-10 working days **In case of holiday** **Holidays will delay the date of receipt** **please wait with patience** ^0^ ^0^ ^0^ ^0^ ^0^ **Other countries mailing time: -** - Please contact the designer to calculate the time OOOOOOOOOOOOOOOOOOOOOOOOOOOOOOOOOOOOOOOOO Founded in 2002, crystalplus has always been based on nature, paying attention to natural materials, carefully studying the characteristics of spar, and designing different accessories through the attitude of “finding, discovering, balancing and coordinating”, breaking through the usual design patterns and techniques. And with the original different styles, incorporating the changes in modern life, convey a deeper level of design concepts. Our gemstone designer aqua has been working with spar for a long time, often exploring different spar interaction characteristics, and using different colors, changes in spar properties, and then matching each other; Science, science and aesthetics combine to create a layered and richly designed design, and with the skill of craftsmanship, create a new design of jewelry.